I watched Duck Soup Sunday at the Pacific Film Archive. Great fun. I don’t remember when I saw it last on a big screen with a real audience. Certainly more than 20 years ago. That’s all very odd, because I just may have seen Duck Soup theatrically more often than any other movie. I first saw it in a packed theater in LA’s Westwood district, on a Saturday night around 1970 or ’71. It was on a double bill with Horsefeathers, which I had already seen on TV. I fell in love with the Marx Brothers that night, and especially with Duck Soup. Over the next twelve years or so, I rarely missed a chance to see my favorite Marx Brothers movie. And there were plenty of chances in those days. Revival movie theaters were doing great business, and the Marx Brothers were big money makers (one LA revival house extended a triple bill of some of their worst movies for several weeks). I could see Duck Soup two or three times a year. But in the early 80s, parenthood reduced my movie-going habits considerably, and home video all but killed revival cinema. I think I took my son to see it theatrically when he was young, but I’m not sure (neither is he). In the early days of DVD, I bought a box set containing Animal Crackers, Horsefeathers, and Duck Soup. These were bare-bones discs, with indifferent transfers and no extras. With the ability to see it at my leisure, I pretty much stopped watching Duck Soup. The magic, it seemed, had gone away. Until Sunday. Watching this great comedy in a theater, with an enthusiastic audience, made it come back to life again. Over the years, I’d forgotten that even the name Rufus T. Firefly gets a laugh. And you barely notice that the mirror scene no sound at all when you’re surrounded by laughter. The big screen also helps Duck Soup. 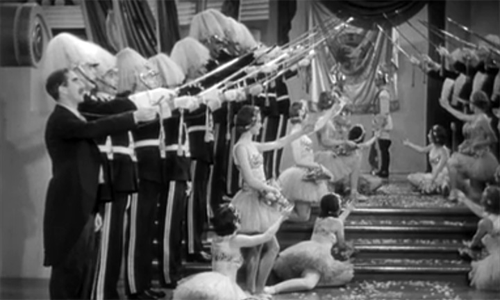 The movie is filled with mock pageantry, from Groucho’s belated entrance to the “His Excellency’s car!” running gag to the patriotic production number “Freedonia’s Going to War” (“We got guns. They got guns. All God’s chillin got guns”). First, the Brothers were always at their best when up against the stuffy, respectable protectors of the status quo, and the richest strain of that gold can be found in the halls of government, where Duck Soup is set. Rufus T. Firefly (Groucho Marx) becomes absolute ruler of Freedonia, appointed by the wealthy elite (Margaret Dumont). 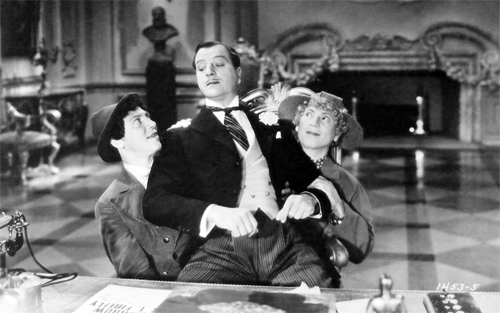 (Harpo and Chico play spies for a rival nation, and Zeppo plays Groucho’s personal secretary.) Groucho encourages graft, refuses to take anything seriously, shortens workers’ lunch hour, and starts a war on a whim. And this film was made before George W. Bush was born. Second, it’s the Marx Brothers stripped down to the bare essentials. It lacks a romantic subplot. Screenwriters Bert Kalmar and Harry Ruby keep unfunny exposition to the barest minimum. The movie even lacks the usual piano and harp solos. There’s very little here that doesn’t provoke laughter. 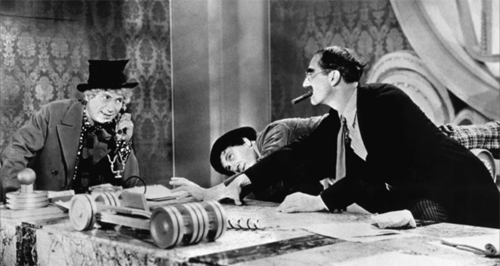 Duck Soup is the only Marx Brothers movie helmed by a well-respected comedy director, Leo McCarey. McCarey started his directing career in Laurel and Hardy silents, and it shows. Harpo has always had a knack for pulling odd props out of his coat, but only in Duck Soup does one portable prop–a pair of scissors–become a running gag. And the peanuts vs. lemonade war, with Harpo and Chico making life difficult for slow-burn master Edgar Kennedy, allows those two Brothers to delve into an entirely different kind of comedy without ever losing character. Having only seen it on DVD for many years, I was beginning to think that Duck Soup might not be the great motion picture I remembered from my youth. Now I know that it’s one of those amazing miracles that the Hollywood system occasionally produces. This so true and I only wish everyone who takes movies for granted because of easy availability on small screens could and then experience Duck Soup (or hundreds of others) Un theaters with audiences. A few weeks ago Duck Soup with Miracle of Morgan’s Creek at the Stanford was a revelation for the people we brought ranging from 31 to 94 years of age. The thing about the early Marc Brothers as with most silent comedies and many early sound examples are the wonderfully rich visual pleasures that are easily seen on a big screen and often lost on the small onea. NOt to mention dramas from Von Stroh win to. Welles. And t these film are also best enjoyed with audiences who gasp, fall silent or are moved to tears collectively.